Dar Chams Location. 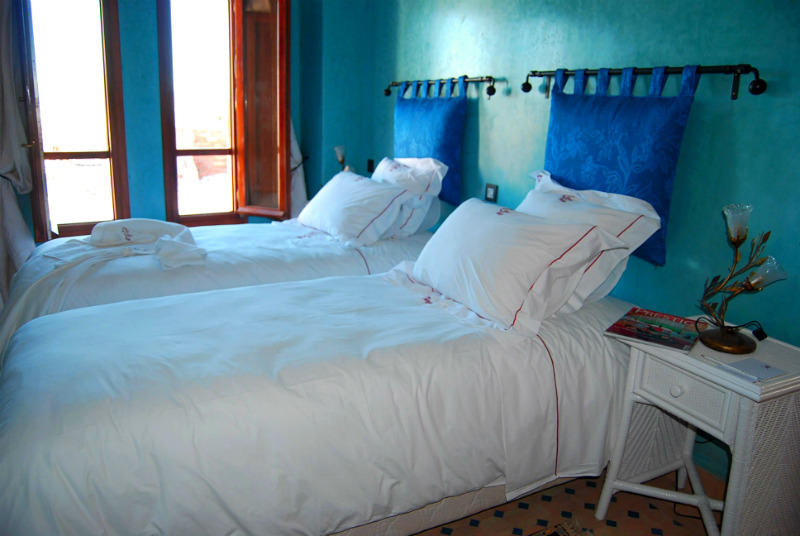 Book Dar Chams Today with Hip Morocco - Holiday Accommodation in Tangier, Assilah & Chefchaouen, Morocco. 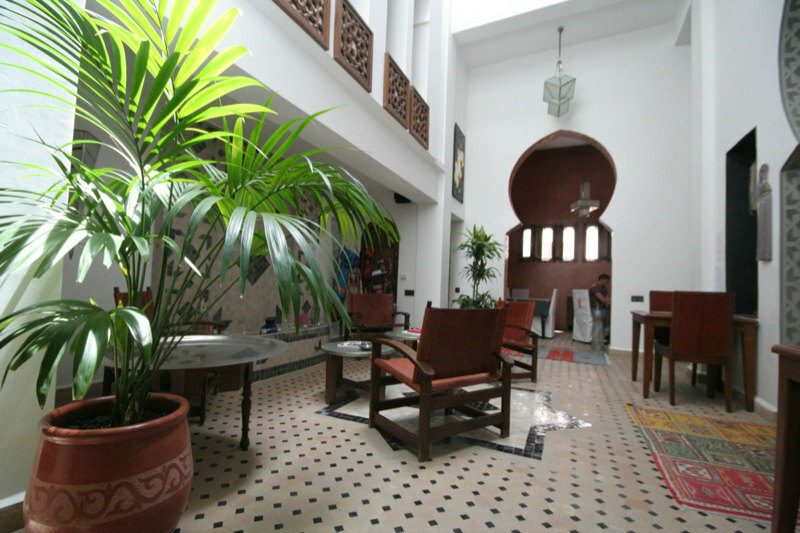 "A grand beautiful Riad in the heart of the old walled medina"
Tangier: A luxury representation of boutique Moroccan culture intertwined with a strong artistic and musical influence greets guest at Dar Chams Tanja. Situated in the heart of the undulating old walled medina, Dar Chams is very well placed to explore the 'white city' of Tangier and its secrets both vibrant and tranquil. The grand patio courtyard greets guests with cool atmospheric colours, relaxing music and the hand craft of countless hugely talented artisans from around Morocco greatly complimented for the intricate finish of the interior at Dar Chams Tanja. 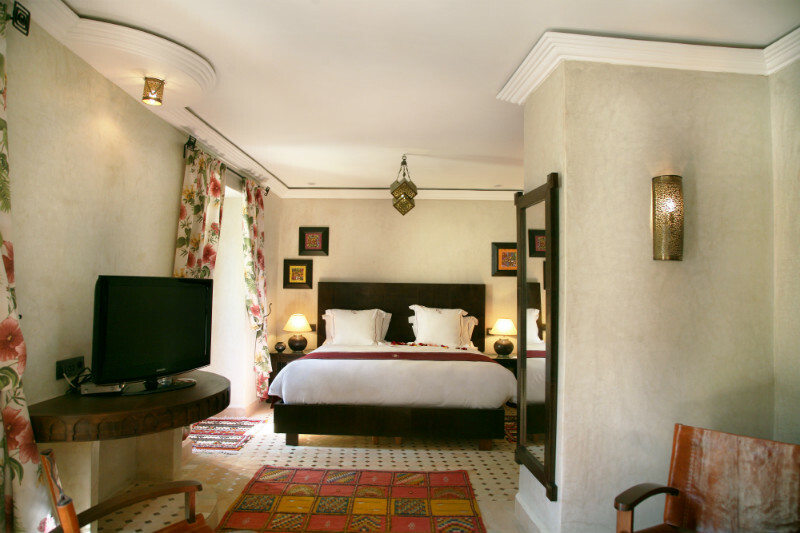 There are 7 rooms at Dar Chams each individually presented with a slightly different contemporary theme but retaining a luxury boutique Moroccan atmosphere and charm. Each room has a collection of intimate and personal additions including remote control jukebox and ceiling air conditioning. 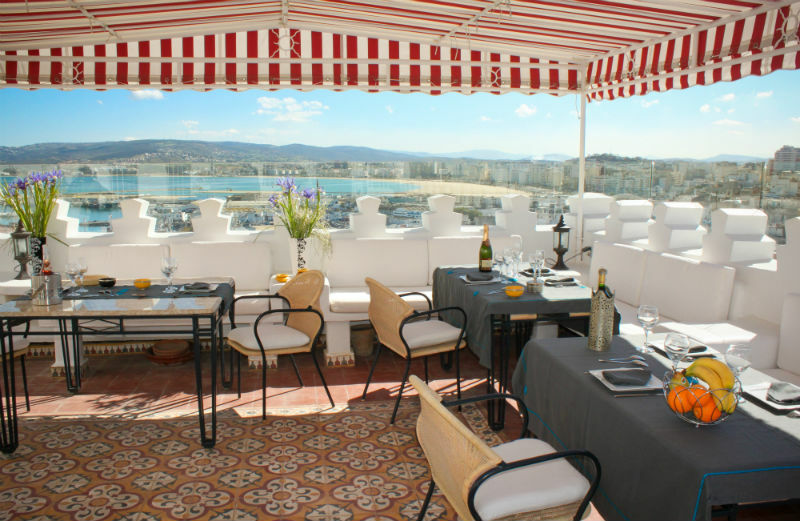 Breakfast should be taken on the roof terrace of Dar Chams with stunning views of the city of Tanjer and ocean. Consisting of a collection of fresh fruits, cakes and patisseries with local chees and breakfast meats, Dar Chams provide an exquisite start to your stay in Tangier. 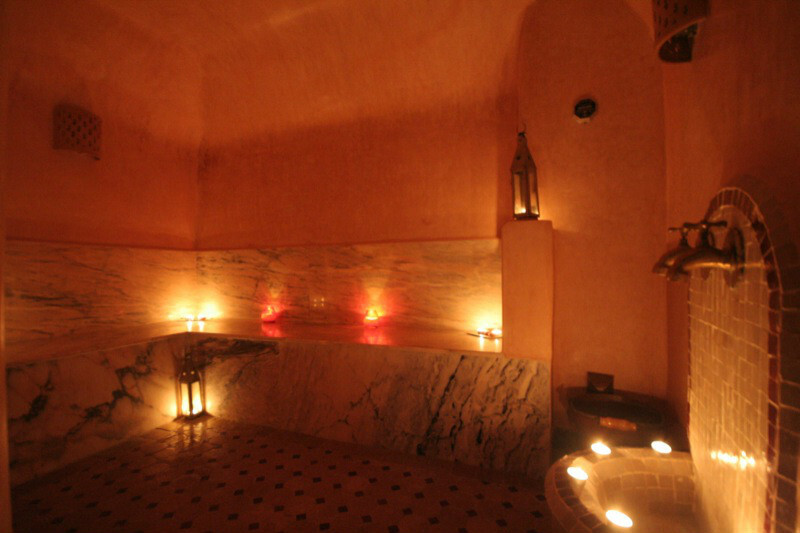 The in Riad hammam is traditional in style with marble benches and beige tadelakt walls. The massage room is available for a range of beauty treatments, and presented with sensual low lights of an intimate relaxing holiday in Tangier. Dar Chams offer an very impressive breakfasts for all its guests. Lunch, light aperatif's or evening meals are on offer from Dar Chams with a selection of beautifully cooked Mediterranean and Moroccan dishes. This charming little seafood restaurant offers a reasonably prices set menu with a range of beautifully cooked fresh dishes from the Atlantic ocean. Styled by the owner Belhadj, Le Saveur du Poisson has a range of homemade juice cocktails and menu of healthy virile cuisine. Le Nabab is set in a old courtyard house with calming ambiant music creating a relaxed seaside atmosphere. 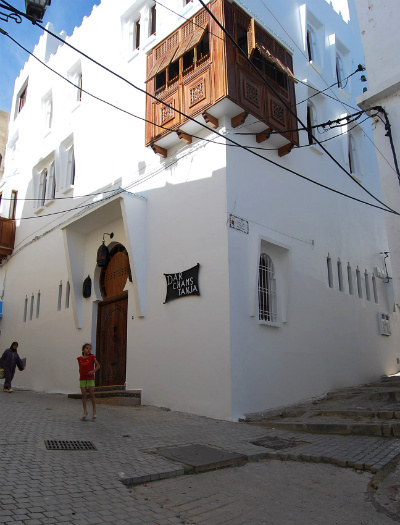 Geared towards tourists, however less commercial than other similar restaurants, it is best to avoid the lunchtime rush of this traditional Moroccan restaurant in Tangier. Tangiers most authentic Italian restaurant, Anna & Paolo have created a ambiant cosy Mediterranean atmosphere offering classic Italian cuisine with plenty of seafood dishes. Dark and non descript from the outside, the interior is a homely and welcoming change. 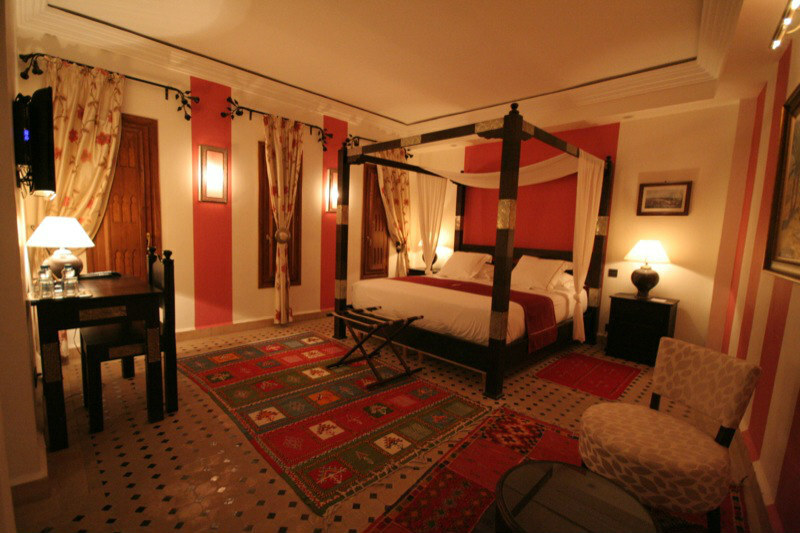 Situated just outside the Kasbah and inside the heart of the old Medina, Dar Chams is very well positioned. 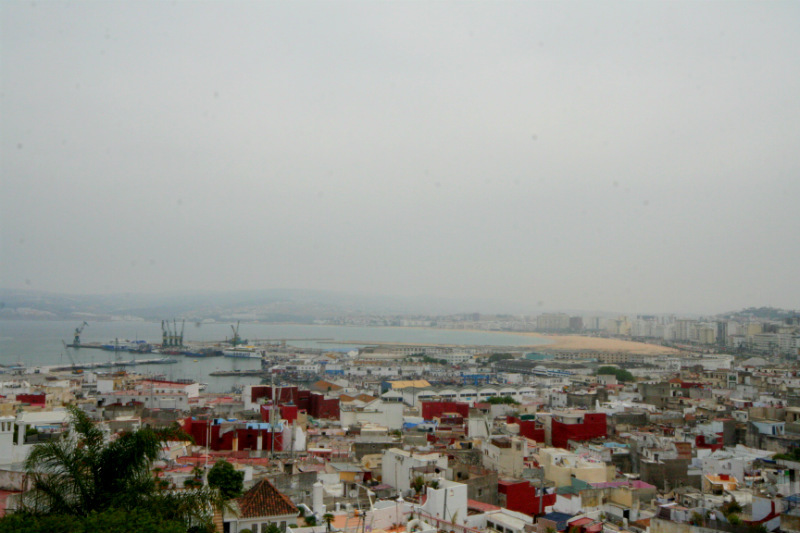 A short walk through the Kasbah and its small bohemian cafes takes you to a panoramic view looking down on Tangier bay and the mountains of Southern Spain. The other direction takes you through the winding hillside medina of Tangier, through a collection of local markets, residential areas, cafes and souks for a taste of indepth authentic Moroccan culture. 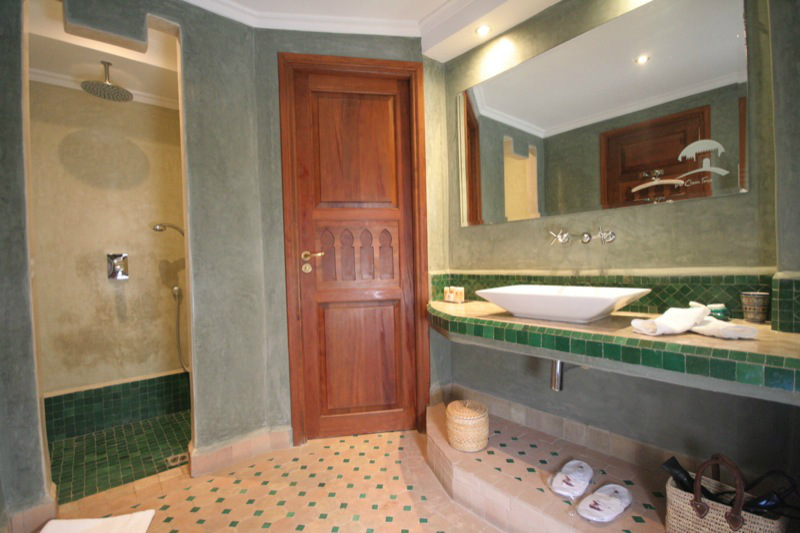 The R'batia suite is a long double room located on the 2nd floor of Dar Chams. There is a seating area of 2 African armchairs with small table and plasma television. The windows face externally onto the derb below. The spacious bathroom is crafted in a earthy green tadelakt with large shower and a single wash basin in Moroccan light brown. 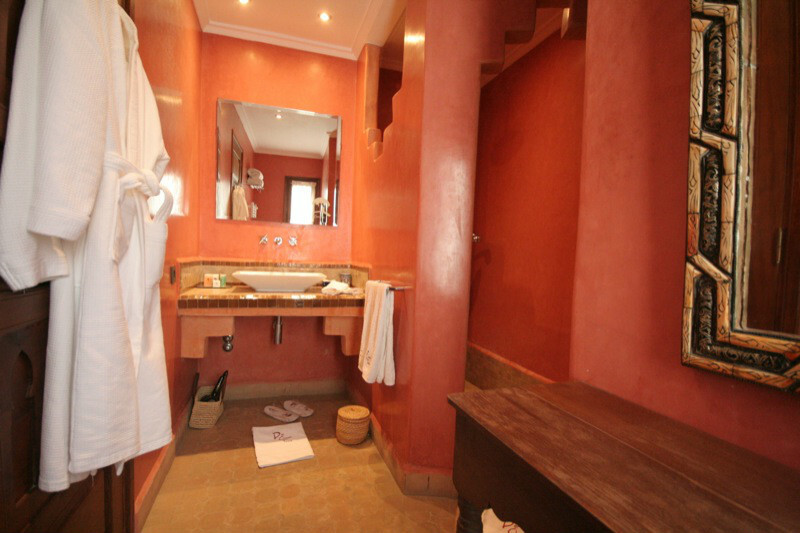 Superior toiletries, gowns and slippers are provided in all bathrooms of Dar Chams. Situated on the 2nd floor, Soussia offers guests a spacious suite with large in room lounge with views over the small vibrant derbs of Tangiers. The large double bed has a grand ornate crafted wooden bed frame and headboard. 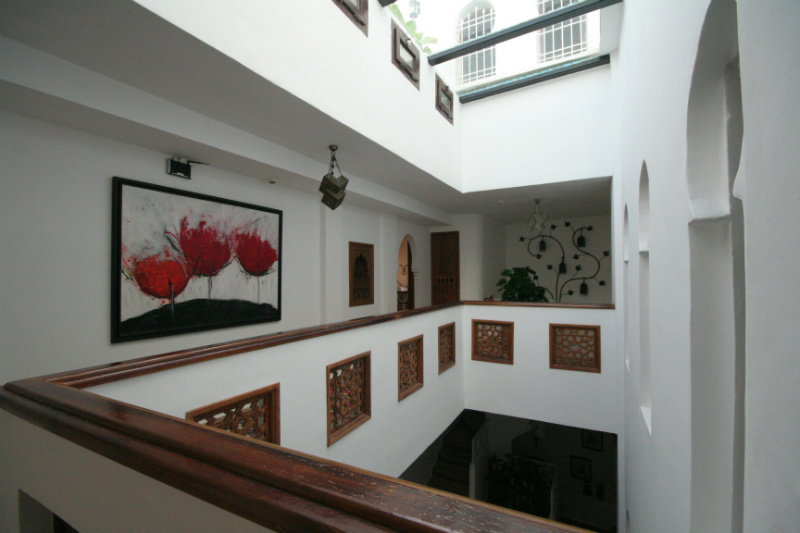 The Soussia suite in Dar Chams has a collection of abstract Moroccan art sitting on the peach tadelakt walls. The ensuite bathroom has a small dressing table and a large shower with arched entrance. A perfect choice for those wanting some extra privacy in their own rooms. 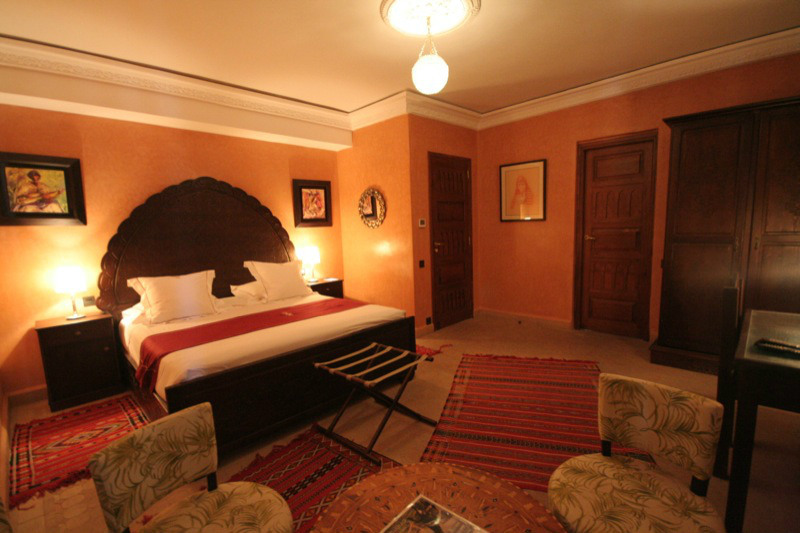 Located on the 2nd floor of Dar Chams Tanja, the Bedaouia room is a spacious double with grand Moroccan 4 poster bed made from dark wood creating a sensual regal atmosphere. As is tradition in Morocco, the windows face internally onto the central light filled patio. The combination of Kasbah artwork on the walls and ornate metal curtain rails, creates an intimate and romantic room, perfect for a deeply relaxing holiday in Morocco. The in room salon has a sofa bed and small table. The large bathroom has a double basin and giant wall mirror perfect for some extended pampering. 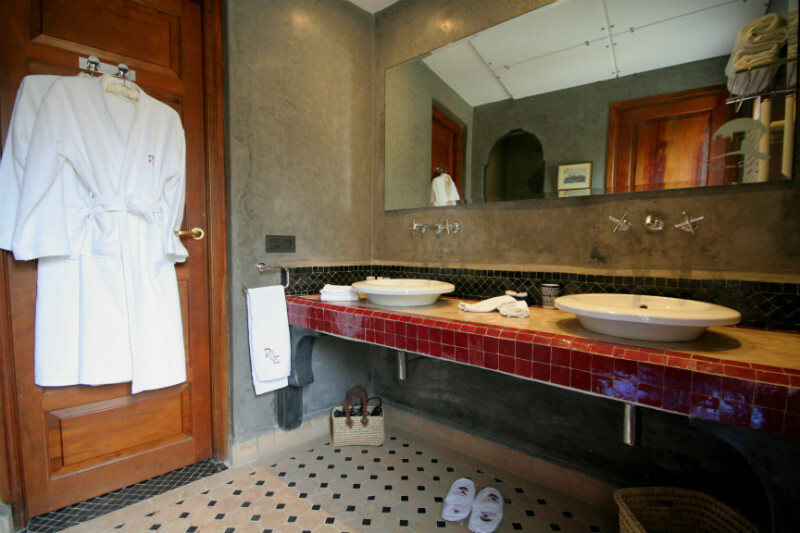 Superior toiletries, gowns and slippers are provided in all bathrooms of Dar Chams. 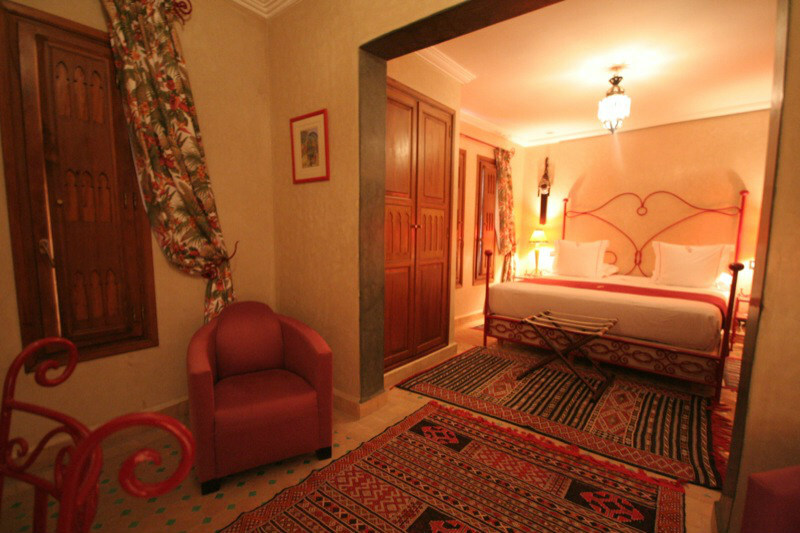 This suite located on the 3rd floor of Dar Chams offers guest a beautiful room for a honeymoon in Morocco or sensual romantic stay in Tangier. The large double bed has a beautiful ornate red metal frame in-between grand Parisian bed side lights. 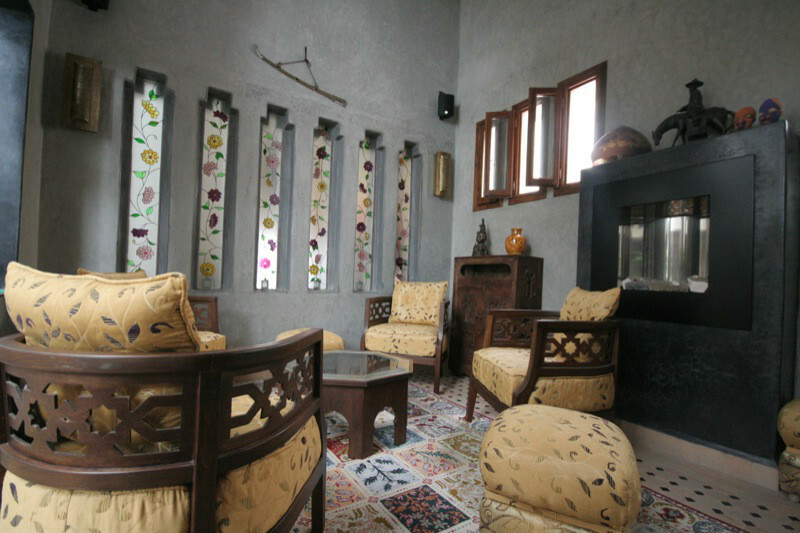 The in room salon has a red metal table and chairs next to a collection of old local and more contemporary Moroccan art. 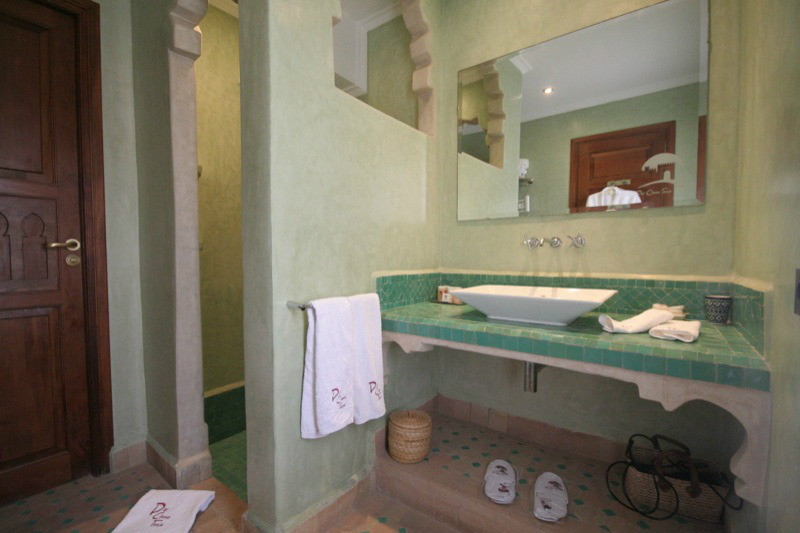 This bathroom at Dar Chams has a large arched entrance shower with big head and aqua green tiling. The Fassia suite at Dar Chams is themed in a decorative deep green with large tall double bed framed by a hand painted ornate bedframe. There is a large plasma screen sitting on the light green walls, and alongside artwork of Moroccan festivals and culture. This spacious suite at Dar Chams Tanjer offers views over Tangiers residential rooftops. The large bathroom has a big walk in shower, luxury washbasin and giant wall mirror. A suite well suited for guests wanting a little more space on your stay in Morocco, with beautiful bedroom views of Tangier. 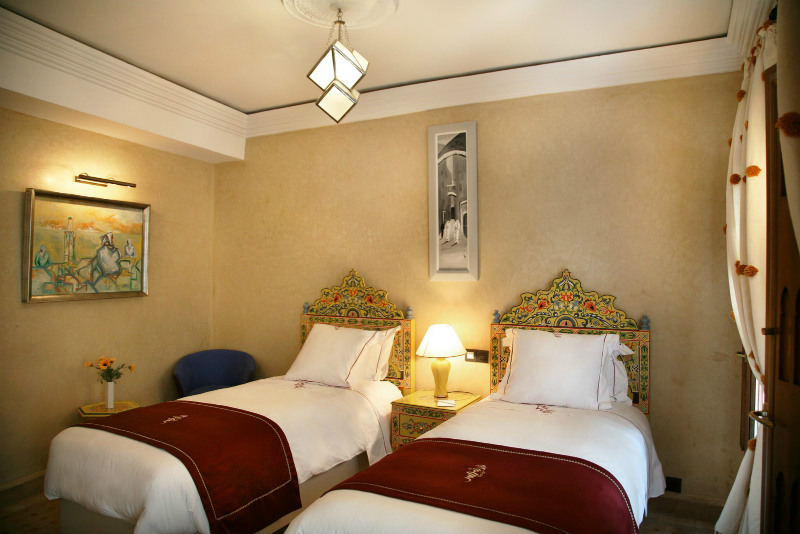 This spacious twin room is situated on the 3rd floor of Dar Chams Tanja in a ornate hand painted Moroccan yellow style. This room has a collection of Berber floor rugs and earthy cream tadelakt walls. The bathroom is decorated in dark yellow and brown colours with large shower and 2 heads. The bathroom widow looks externally onto a small local square and gate to the Kasbah. A perfect choice for a friends holiday in Tangiers. 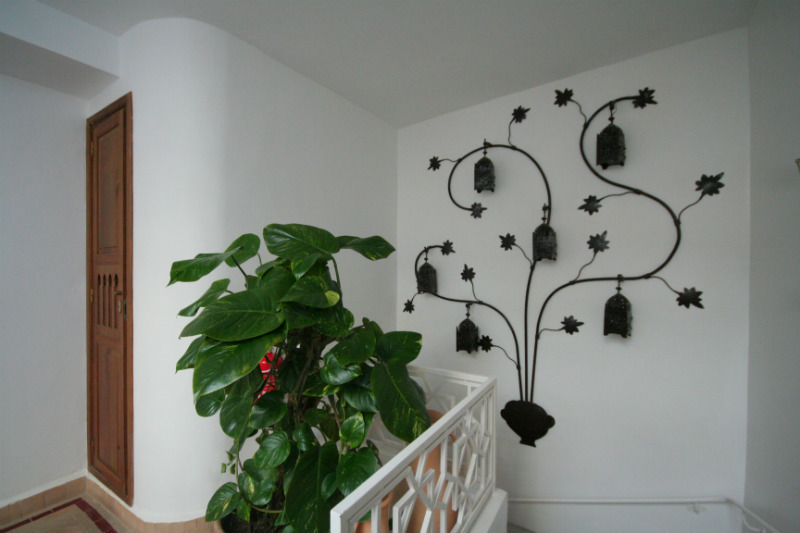 Walls are occupied with a collection of contemporary Moroccan art. The spacious green tadelaked bathroom has a large shower with big head alongside the wash basin and giant wall mirror. 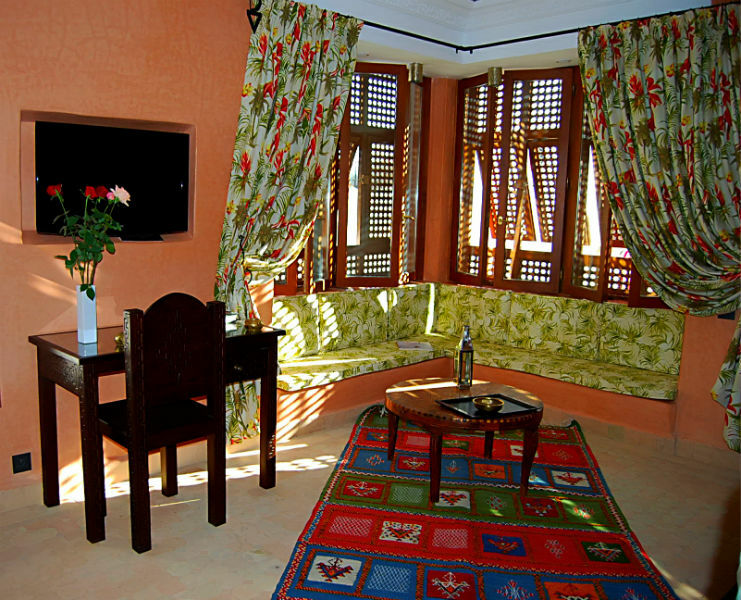 The base rate price at Dar Chams is in pounds, euros, or Moroccan dirhams and exchange rates are approximate.